Appy Hour is back! Summer is the perfect time for outdoor gatherings with friends and family. And since cooking in the heat (and lately humidity) is pretty far from our minds we came up with this simple, yet impressive recipe for a fancy appetizer. These crostini use toasted baguettes made from scratch daily in our own bakery and are topped with juicy local nectarines, local basil and goat's milk ricotta cheese that'll knock your socks off. 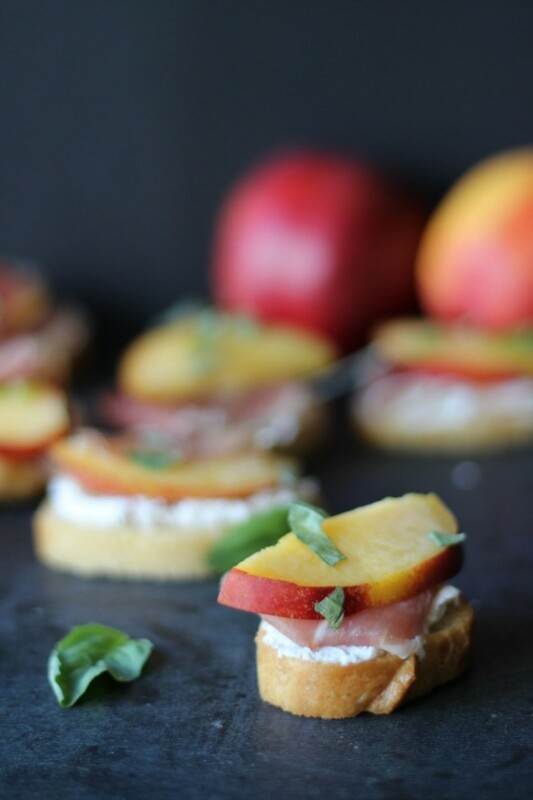 To make these delicious little bites you will need: About 18 pieces of sliced and toasted baguette 1 container of Amaltheia Dairy goat's milk ricotta chese 1 nectarine pitted and sliced 8-9 slices of prosciutto 5-6 fresh basil leaves, torn into small pieces Top bread slices with ricotta cheese. Tear prosciutto slices in have and place on top of the cheese. Place a nectarine slice on top of each and sprinkle with basil leaves.